"It was held in the Town Hall Darwin on Thursday evening 22 April 1915. The Town Hall was decorated for the occasion with flags of allied and neutral nations and graceful palm leaves. The Darwin Brass Band under the leadership of Mr CM Clark played a musical item outside the hall, afterward occupying [the stage of the hall] playing patriotic and national selections during the evening." In 2014 the Northern Territory Archives Service received a donation from Mr James Walker of Victoria of a programme kept by Mr Jack Burton who attended this event on the 22 April 1914, in his role at the time as Lord Mayor, and President of the Australian Workers' Union in Darwin. Mr Walker is the great nephew of Mr Burton. This programme, a small item printed in black on fringed cream silk fabric, lists the names of the enlisting men and dignitaries attending the event on 22 April 1915. Details printed also included a range of toasts and responses offered by various participants to the Allied Forces, including those by Mr Jack Burton, the Reverend Father Gsell, Justice Bevan and Mr Karl Nylander. The pianist Mr Percy Phillips and the Darwin Brass Band performed at the event. 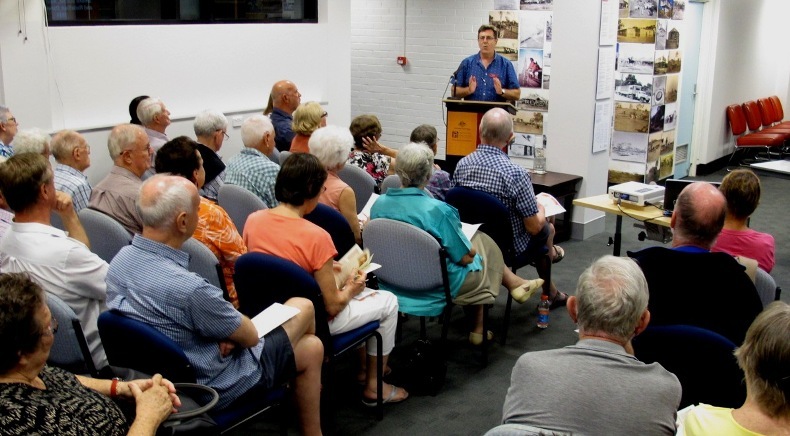 On 22 April 2015, a century to the day since the smoke social event to farewell contingent was held, Dr Matthew Stephen presented a talk at the Northern Territory Archives Centre looking back at this event, some of the characters, and the Territory during the period 1914 to 1919. Listen to the audio recording (17.6 mb) of Dr Stephen's talk Smoke Socials, meat works and rebellion – Darwin 1914 to 1919. Read Dr Stephen's presentation (6.5 mb). For more research on World War I, contact the NTAS reference staff. Service number not found, 25th Battalion, enlisted in April 1915. He was the Officer leading the first official contingent to leave the Territory sailing on the SS Changsha on 26 April 1915. He was Company Commander in Gallipoli and later in France and Belgium where he was killed in action in June 1916 at Messines. Lewis was a veteran of the South African War. His wife was the matron at the Darwin Hospital. After he died she stayed in Darwin, taking position as manageress of the Victoria Hotel. She left Darwin in 1919. No 1033, 25th Battalion, enlisted in April 1915. He returned to Darwin in 1919 to take up his position again as Curator at the Botanical Gardens until 1936. No 1041, 6th FAB, enlisted in April 1915 he returned to Australia in 1918 after being seriously wounded. He lived until the 1940s. No 1036, Corporal, 25th Battalion, enlisted in April 1915, he was killed in action in July 1918 in France. He was buried in the Crucifix Corner Cemetery, Villers-Bretonneux, France. No 1037, Private, 25th Battalion, enlisted in April 1915. He was killed in action at Gallipoli. He is buried in Embarkation Pier Cemetery at Gallipoli. No 3339, 6th Field Co. Engineers, enlisted in August 1915. Douglas left Darwin on the SS Eastern in August 1915.He was killed in action in July 1916 in France. No 1038, Private, 25th Battalion enlisted in April 1915. He served in Gallipoli for four months but suffered from chronic rheumatism and could not go on. He returned to Australia in January 1916. 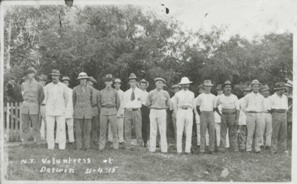 He became a committee member of the RSL in Darwin. He had a long involvement in Territory Mining. He died in Melbourne in August 1937 aged 64 and is buried in the Springvale Military Cemetery. No 1040, Private, 5th MG Battalion, enlisted in April 1915. Fawcett had arrived in the Territory aged 15 and worked at the AE Jolly's Store. He served at Gallipoli where he became seriously ill with enteric fever. He was invalided and came home to Adelaide early in 1916. He recovered his health and volunteered again to serve in France until the end of the war. He returned to Australia in May 1919 and resumed work at the AE Jolly's Store. He retired in 1942 as Manager after 30 years of service. He took over the Adelaide River Hotel in 1946, and rebuilt it where it stands today. James Fawcett was one of the original three trustees of the RSL Memorial Hall, Darwin. No 1044, Sergeant, 25th Battalion, enlisted in April 1915. Lesley Giles was the son of Alfred Mary Giles of Springvale Station on Katherine River. He had been a member of the cable guard. He served at Gallipoli and was wounded. He was wounded again at Pozieres France in 1916. He returned to Australia in June 1919. He was a prolific letter writer and many of his letters were published in the NT Times and Gazette. Returned to the Public Service in Darwin he became Government Secretary and acting Administrator. No 1042, Lance Corporal, 25th Battalion, enlisted in April 1915. He was killed in action in October 1917 in Belgium. No 1041, Private, 9th Battalion, enlisted in April 1915. He served in Gallipoli and later in France. He was killed in action at the battle of Pozieres in August 1916. No 1043, Australian Camel Corps., enlisted in April 1915. He served in Gallipoli before transferring to Camel Corps in Palestine. He returned to Darwin by 1920. No further information could be located. Reported by AW Hare as being in France. No further information could be located. No 1045, Private, 25th Battalion, enlisted in May 1915. He served in Gallipoli before becoming ill. He was evacuated to Malta. He returned to Australia in October 1917. Service number not found, left Darwin with the first contingent. No further information could be found. No 1049 Lance Corporal, 25th Battalion, enlisted in April 1915 and returned to Australia in March 1917. No 1047, 2nd Field Battery, enlisted in April 1915 and returned to Australia in March 1919. Service number not found, 9th Battalion, left Darwin with the first contingent. He returned to Darwin in early 1916. His service in Gallipoli is confirmed by the Greenshields letter published in the NT Time and Gazette on 16 March 1916. No 7361, 11th Battalion, enlisted in November 1916 and returned in March 1918. No 1051, Private, 25th Battalion, enlisted in April 1915. Harry was a keen sportsman and excellent rifle shot, being a Corporal in the Cable Guard before enlistment. He served as a sniper in Gallipoli before entering the war in France where he was mortally wounded at Pozieres and died in August 1916 aged 24. He is buried in France. No 1062, 2nd Pioneer Battalion, enlisted in April 1915. He was killed in action in June 1916. No 1418, 9th Battalion, enlisted in December 1914. Territory born son of Tom and Eleanor Styles (nee Tuckwell). Walter joined the AIF in Cairns. He was wounded in action at Gallipoli in June 1915. After a month recovering in Egypt, he rejoined his unit to be mortally wounded, dying in July 1915. He was buried at sea from the Hospital Ship Rewa. No 1055, Private, 25th Batallion, enlisted in April 1915. He returned in January 1919. He was a Maltese by birth and was employed by the Survey Department before enlisting. After the war he returned to Darwin and resumed his work with the Lands and Survey Department. Service number not found, was a member of the first contingent to leave Darwin. No further detail could be found. Service number not found, enlisted in October 1915 and left Darwin on the SS Montoro. No further detail could be found. No 1064, 25th Battalion, enlisted in April 1915. Termansen was a Danish seaman aged 36 at the time of enlistment. He was killed in action in November 1916 in France.